Since 2001, the RPRA has offered an evening speakers program. These lively and enriching talks take place in the Community Hall six to eight times a year. A variety of distinguished speakers and topics have included: David Halton on his career as a television journalist and on his book about his father, war-time correspondent Matthew Halton; Chief Justice Beverley McLachlin on the Supreme Court and personal reflections; Elizabeth May and Tom d’Aquino debating environmental matters; Rt Hon. Joe Clark on the need for national conversations; Andrew Cohen on the Washington scene, John F. Kennedy, and Lester B. Pearson; Mark Kristmanson concerning opportunities ahead for the NCC; and, Her Excellency Sharon Johnston about her debut novel. Engaging question and answer periods follow these presentations and the evenings finish with coffee and cookies and discussions with neighbours. Admission is free. The Rockcliffe Park Garden Club has been going strong for more than 25 years. Whether you are a novice gardener, or have a natural “green thumb,” you will enjoy the program of speakers and workshops. Club meetings occur between September and April in the Community Hall, 380 Springfield Road. Sometimes the group hosts a plant-sale in May in the Jubilee Garden and the annual June bus tour of gardens in the National Capital Region is not to be missed. Membership is $25 annually for one person or $35 for two; the guest fee is $5.00 per meeting. Watch the Rockcliffe News and RPRA bulletin board at 380 Springfield Road for event notices. A Rockcliffe Park Lindenlea League soccer program is open to children aged four years and up who live in the area. Rockcliffe Lawn Tennis Club (RLTC), located on Lansdowne Road North, is a private club with eight outdoor courts, an inviting clubhouse and programs for juniors and adults. The club offers round-robin tournaments, summer camps and tennis instruction from the club pro. Members pay an initiation fee and annual dues. In winter, the Hosers maintain a hockey rink adjacent to the Rockcliffe Park Public School playing fields (beside Buchan Road) with a warming hut for changing skates. A smaller rink for young children and pleasure skating is maintained in the Jubilee Garden. The Hosers are building a sports pad for all-year play and a field house to be completed in 2018. The Ottawa New Edinburgh Club (ONEC), on the banks of the Ottawa River and just off the Sir George-Etienne Cartier Parkway, offers tennis with red clay courts, rowing and sailing programs for adults and children and summer day camps. Its historic boathouse is available to members and for special events. This branch is a hub of our community. Volunteers and OPL staff create a vibrant space by offering programs for children and adults. Membership in the OPL system is free to all Ottawa residents. Several computers are available for public use including two dedicated to the system-wide catalogue. Rockcliffe residents can request books from any branch in the OPL system as well as inter-library loans. Other services include WIFI, e-book tutorials and computer tutorials (both by appointment), electronic databases, various genealogy resources, the Every Child a Reader program, and writing contests throughout the year. Volunteers help with the annual RPRA library book sale, Open House events and shelving and retrieval tasks. 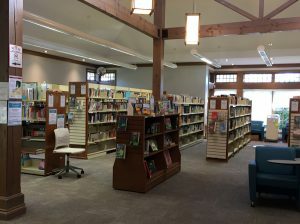 The branch also offers Toddlertime and Storytime as well as Meet the Author events and special programs for local schools. An external book return slot at the front of the library facing Springfield Road makes it easy to return library materials at any time the library is closed.